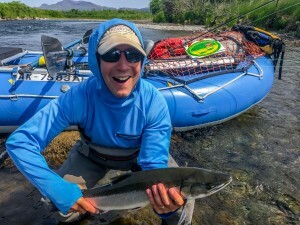 This is the both the best week for camping with your family and best week of the year to hunt trophy Goodnews River Rainbows, huge Arctic Grayling, Dolly Varden Char, and King Salmon in Solitude! 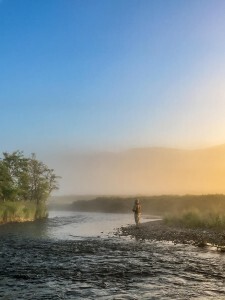 We’ll float and fish the Middle Fork of the world-renowned Goodnews. The scenery is sublime. The staff will set up camp in some of the most beautiful wilderness scenery you can imagine. 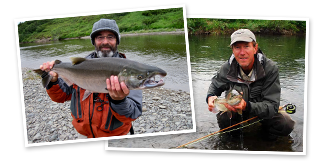 The middle Fork is an “intimate river”, smaller water, shorter casts, and more wildlife than other Bristol Bay rivers. Its remoteness makes it a true adventure. 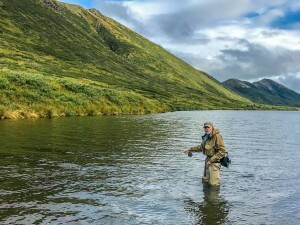 This week tends to have the best weather of the entire Bristol Bay season with sun drenched days and midnight sun nights. We’ll fish dries and mouse patterns in the headwaters and streamers throughout. 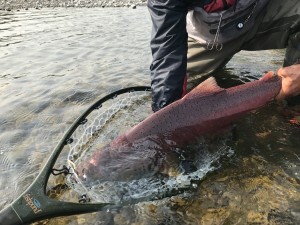 We will sight fish to King Salmon- the most powerful and challenging freshwater fish in North America and take trophy big Sea Run Dolly Varden Char. 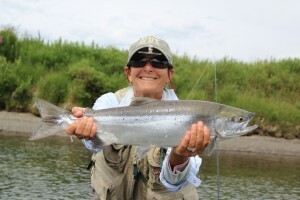 6 Days and 5 nights of Rainbow, Grayling, Dolly Varden, Sockeye, Chum, and magnificent Kings. This is the most popular week for a family with young anglers and anglers who want a shorter trip. 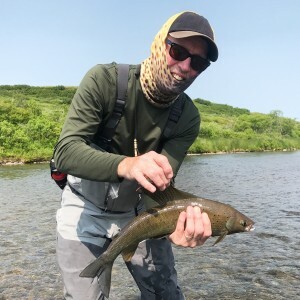 Geoff holding a beautiful bright Dolly Varden Char. Mike releasing a big King Salmon. An early morning on the Middle Fork. Blue Skies and quiet mornings. The Middle Fork has many trophy Grayling in the headwaters. A Middle Fork King Salmon swimming away strong.